Blizzard is opening the Diablo III beta to the public this weekend in an effort to stress test the game’s servers before the full title is released next month. All one needs to play the highly anticipated game is a Battle.net account and plenty of free time. Players will have access to a small section of the game’s first act where they travel to Tristram and become familiar with a few of the main characters such as Deckard Cain’s niece Leah Cain. After setting out into the countryside in search of Deckard, the beta ends with a battle against the Skeleton King. The beta will open on April 20 at 12:01 pm PDT and remain playable through April 23 at 10:00 am PDT. Weekenders will have access to the same beta game as closed players with the exception of not being able to post in the beta forums and not being provided Beta Bucks to use in the currency-based auction house. 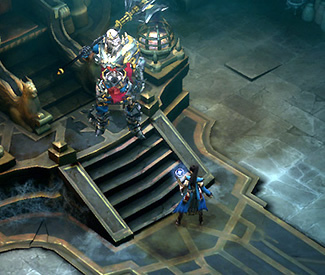 The English, French and German versions of Diablo III will be playable this weekend. Regional differences and features in the Korean version means that a separate beta test will be conducted for Korea, Hong Kong, Macau and Taiwan next week. Those who are already in the closed beta will still have full access over the weekend, although Blizzard notes that gamers might experience more lag or disconnects than normal. The closed beta will continue to run through May 1 and the full game is still scheduled to launch on May 15.